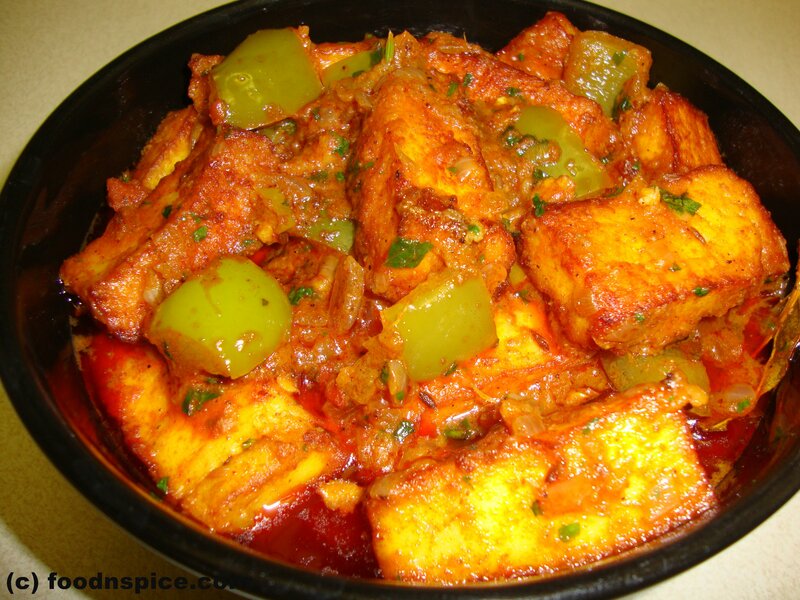 Cut the paneer into thin long strips and deep fry lightly in oil. Place in lukewarm water. Heat oil in a pan and add cinnamon, bayleaf and cumin. Saute for about 5 seconds. Add the chopped onion and fry till the onion becomes transperant. Add the ginger garlic paste, green chilies and saute for about 2 minutes. Add tomatoes, red chili powder, coriander powder, turmeric powder, garam masala powder, salt and mix well. If the masala is very dry, add little water. Add capsicum and cover the pan and simmer it for about 5 minutes until the capsicum is cooked. Finally add the paneer pieces and mix it well. Cover and cook on a low flame for about 3-4 minutes. Add chopped coriander(cilantro) leaves,stir and switch off the heat. Serve hot with rotis. Heat oil in a kadhai or a pan. 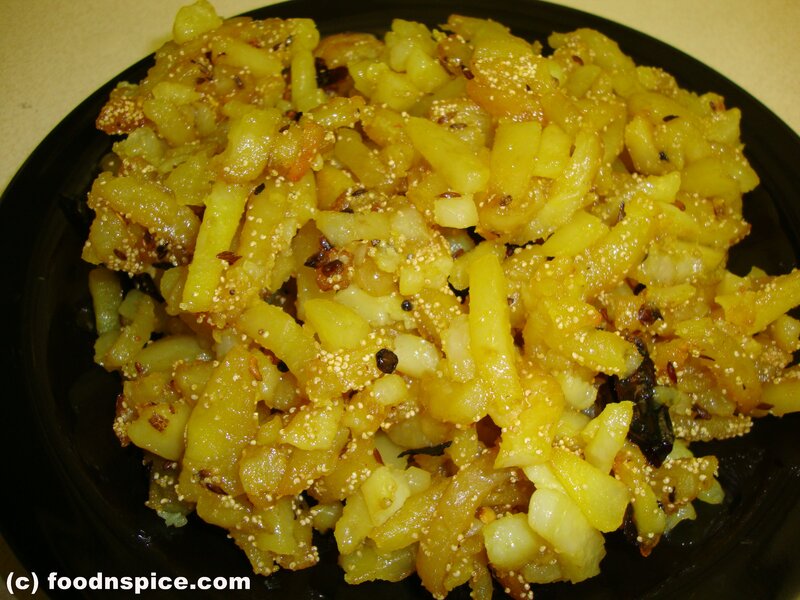 Add mustard seeds, when they crackle, add curry leaves, onion, green chilies and saute till the onion turns pink. Add hing and turmeric powder. Mix and add potatoes, capsicum and salt. Fry on a high flame for 1-2 minutes. Add about 1 tbspn water and mix thoroughly. Cover and cook on low flame till potatoes are tender and all the moisture evaporates. Stir in between. Turn off the heat and add grated coconut. Mix well. Serve hot with chapatis, puris or parthas. Variation: You may also add a chopped tomato, 1 tsp red chili powder, 1 tsp coriander powder before adding capsicum and potatoes. Finish this by adding 1 tbspn ground peanut powder instead of the coconut. 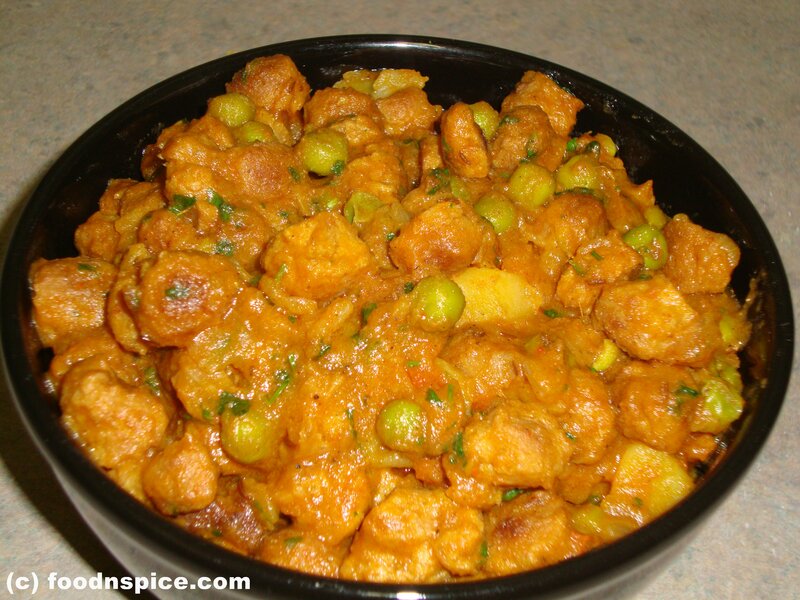 Pressure cook potatoes, cauliflower, peas, beans and capsicum along with turmeric powder, salt and 2 cups of water, till soft. Mash all the cooked vegetables using a masher or a hand mixer. Heat oil in a vessel, add green chilies and onions and saute till onions turn light brown. Add the ginger-garlic paste and saute for another minute. Add red chili powder, coriander powder, pav bhaji masala, garam masala powder and salt. Combine well. Add the tomatoes and cook until soft, approx 5-6 minutes. Add little water, if required. Add the mashed vegetables and mix well. Reduce flame and cover and simmer for 14-15 minutes. Be aware that the mixture can spurt up as it boils, so keep a lid on it while you are not actively stirring it. Cook till the bhaji(gravy) thickens. Adjust the salt, if required. Turn off the heat. Add butter and lemon juice and combine. Garnish with coriander leaves. Slice the pav buns horizontally and butter both the sides. Place them on a heated griddle and cook till the buttered sides are brown. 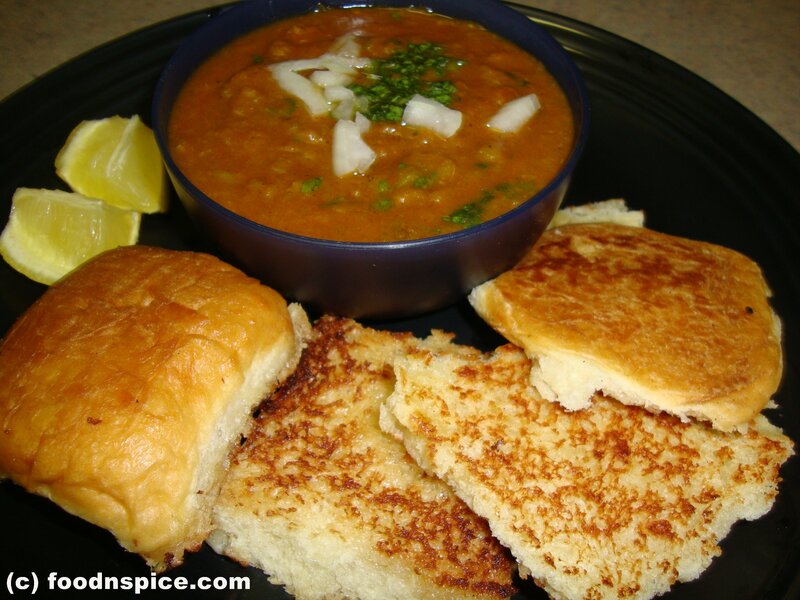 On a serving plate, place the toasted buns and a bowl of Bhaji garnished with coriander leaves. In another small plate place chopped onion and a lemon wedge. To make cheese pav-bhaji, top the Bhaji with some shredded cheese. In India, the brand used is Amul cheese…in the US, Cheddar(white) cheese comes close to this. Also, if you do not have a pressure cooker, just boil the veggies with salt till soft and then smash with a hand mixer. The pressure cooker just makes the whole process quicker and you can add all veggies at once. If not using pressure cooker, would have to boil the potatoes separately as they take longer than the other veggies. Rub turmeric and salt on the cut potatoes and keep them aside for 30 minutes. 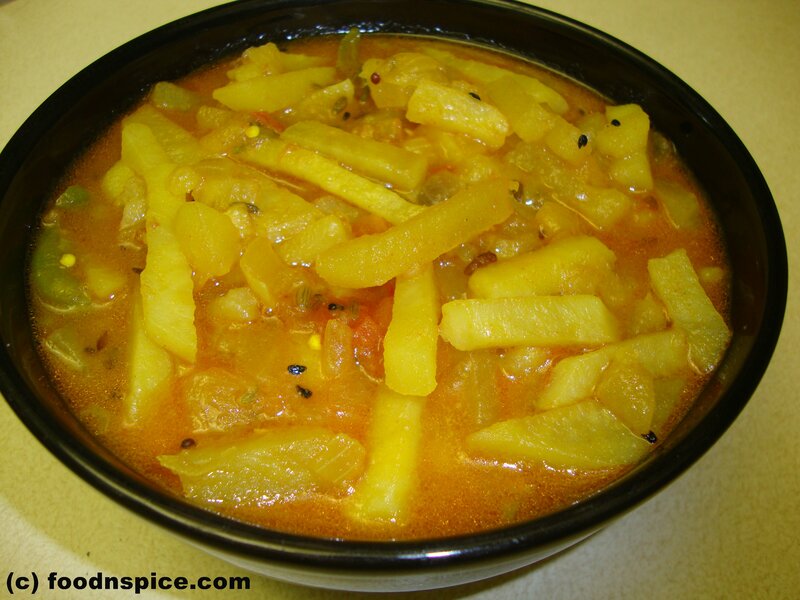 After 30 minutes, drain the salt and turmeric water left behind by the potatoes. Heat oil in a pan. Add cumin seeds, red chili and poppy seeds. Add the potatoes and fry them on a high flame for 1-2 minutes. Then cover and cook on a low flame till the potatoes become soft. Remove stems, wash spinach thoroughly in running water. Blanch in salted boiling water for two minutes till the leaves turn bright green. Refresh in chilled water. Squeeze out excess water. Grind spinach into a fine paste along with green chillies and coriander leaves. Cut the paneer into cubes. Heat 2 tbsps of oil in a pan and stir-fry the paneer till slightly brown. Remove and drain on paper towels. Keep aside. Heat oil in a pan. Add cumin seeds. When they begin to change color, add ginger garlic paste and saute for half a minute. Then add chopped onion and cook it till it turns transparent. Once the onion is done, add tomato puree, red chili powder, coriander powder, cumin powder and garam masala powder. Now add pureed spinach and salt. Cover and cook on low flame for about 5 to 10 minutes. 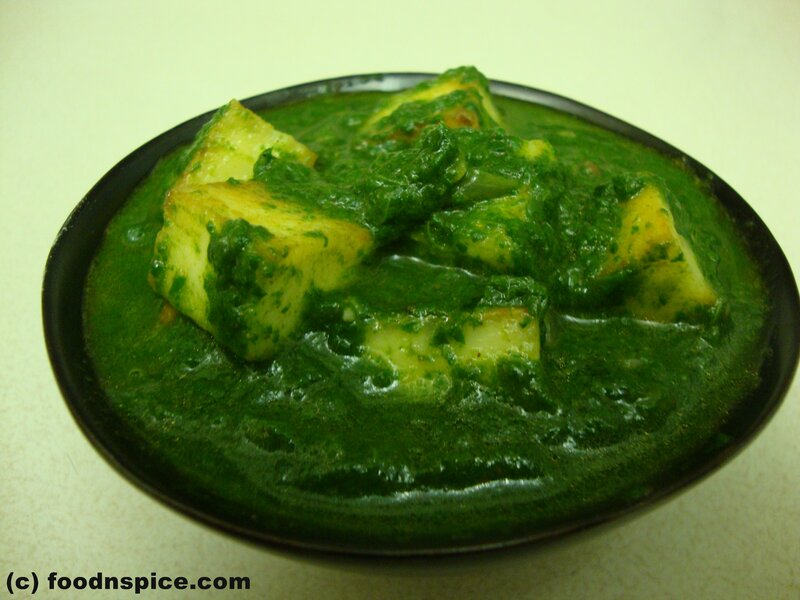 Add fried Paneer cubes to the cooked spinach mixture and cook covered for another 5 minutes. 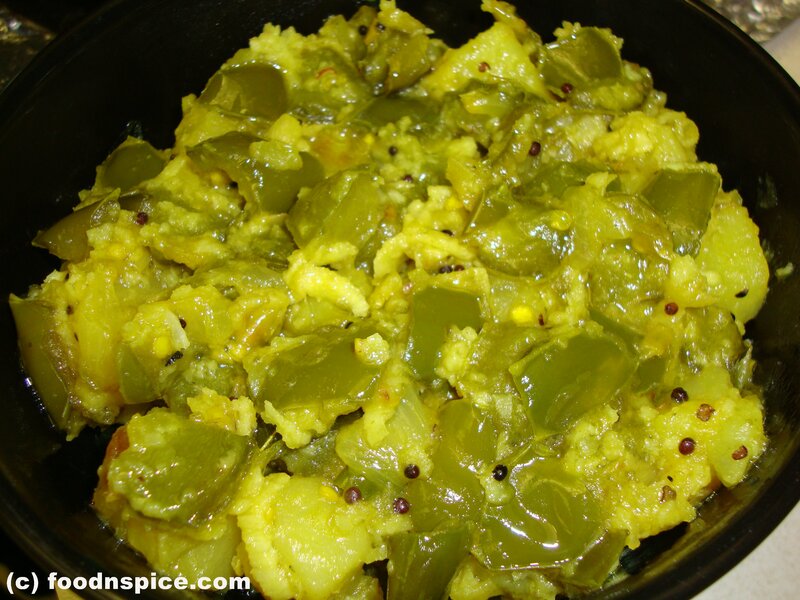 Remove from heat, stir in the lemon juice and serve hot with with rotis or parathas.